Progressive Party of Maldives (PPM) MPs have decided to vote for Criminal Court Judge Muhthaz Muhsin as the new Prosecutor General (PG) despite the party’s leader, former President Maumoon Abdul Gayoom, urging ruling party MPs to vote for his nephew Maumoon Hameed. Majority Leader MP Ahmed Nihan told Minivan News today that 33 out of 38 MPs present at a parliamentary group meeting this afternoon voted in favour of Muhthaz. Nihan – parliamentary group leader of the PPM – also confirmed that a three-line whip has been issued for all 43 PPM MPs to vote for Muhthaz’s approval to the vacant PG post. The decision comes after PPM Leader Gayoom sent a letter yesterday – subsequently leaked on social media – appealing for the party’s MPs to vote for Maumoon Hameed, son of former Atolls Minister Abdulla Hameed. 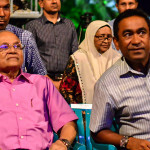 Gayoom noted that President Abdulla Yameen had declared at a PPM rally that he wished to appoint Maumoon Hameed to the post and that the president had “sent a message through the PPM’s official viber group” requesting the party’s MPs to vote for the lawyer. Following a vetting process, parliament’s independent institutions oversight committee had rejected both of President Yameen’s nominees last week. While a minimum score of 75 marks was required for the committee to recommend a nominee for approval, Hameed received 33 percent and Muhthaz received 67 percent. The committee’s evaluation report has been tabled in the agenda for debate at Monday’s sitting of parliament, after which the nominees will be put to a vote. Meanwhile, Gayoom sent a letter to MP Nihan – also leaked on social media (page one and two) – last week demanding an explanation of the PPM-majority committee’s decision. The oversight committee – chaired by PPM MP Ali Saleem – is comprised of five PPM members, one MP from coalition partner Maldivian Development Alliance (MDA), three opposition Maldivian Democratic Party (MDP) MPs and two Jumhooree Party (JP) MPs. In his letter, Gayoom contended that a committee meeting held on July 10 where the nominees were interviewed – where the chair had “acted arbitrarily” – was conducted in violation of parliamentary rules of procedure. Gayoom said he had learned that the nominees were summoned without a vote by members and that an assessment criteria had not been passed prior to the interviews. Moreover, he added, the marks sheets were not tallied in the presence of committee members. Gayoom also argued that a sitting judge could not stand for the post of PG, citing article 151 of the constitution – which requires judges to “devote his full time to the performance of the responsibilities of a judge” – and a “legal norm” whereby judges who leave the bench must wait two years before practicing law. While article 26(a) of the Judges Act stipulates that a judge who stands for a political post specified in law or the constitution would no longer be a judge, Gayoom noted that Muhthaz had not done so. However, the Judicial Service Commission (JSC) has since said that judges could apply for posts in independent institutions. She also alleged that Yameen had conspired for the previous parliament to reject Maumoon Hameed in April by ensuring that several PPM MPs would be absent for the vote. 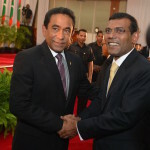 Several pro-government MPs – including PG Leader Nihan who was with President Yameen in Japan and MDA Leader Ahmed Siyam – were conspicuously absent at the sitting, which saw Hameed fail to garner the required 39 votes after falling just three votes short. A majority in the 18th Majlis is 43 seats. In addition to its 43 MPs, the PPM’s coalition partner MDA has five MPs. The minority party announced today that its MPs would also vote for Muhthaz. Cherish what little time you have left on this world, before his death squads tear you to pieces, just like how they did to Afrasheem. "Prime" Minister Adeeb calls all the shots in the current government and ruling party PPM. As the second in command of the government and PPM Adeeb is the only person who decides candidates for all these political posts. Adeeb has his reasons to select Muhuthaz as Prosecutor General. Hence, not even Maumoon can prevent this. Muhuthaz who was a pawn of Adeeb even in the criminal court will now be given the all important task of deciding who to prosecute and more importantly who not to prosecute. As the most powerful person of this government, Adeeb literally runs all the important ministries and departments regardless of whether some of these departments are officially under his mandate or not. Adeeb's meteoric rise in power and influence is greatly attributed to his quick and sudden mysterious wealth and his ability to accumulate vast amounts of money within a short period of time. Maumoon has no relevance in the current government. The name of the game today is "MONEY" !! This is just smoke and mirrors, a game played by Gayyoom and his party. The public is probably bemused by all this. What's Gayyoom trying to prove? That democracy still works on paper? We aren't fooled. Majority of the public are naive to think that Maumoon can get President Yameen to bend and dance to every beat Maumoon plays. Thats a big mistake. Maumoon was useful to win the Presidency and still has considerable influence BUT within limits. Where Maumoon's influence ends is where Adeeb's power begins. Adeeb is the hand picked right hand man of the President. Adeeb is the Prez's closest and trusted buddy who "surrounds" the Prez at all times. With his unimaginable power Adeeb can command and control every branch of the government. As far as PG's post is concerned this post is a strategic post that Adeeb wants to control. So however much Maumoon may ventilate, this match will be won by superman Adeeb. You are spot on with "Prime" Minister Adeeb! Anyone who doesn't obey his biddings will be prosecuted and all those who run after him to do whatever he asks will lack sufficient evidence to be prosecuted. Only Allah can stop Adeeb from destroying this country. 'moke and mirror' is the best explanation. Do not be fooled by deception. one of the first ploys to show Yameen is his own own man. Hope it works..
Yameen WILL NEVER love his brother Maumoon, no matter what he did for him. If not for Maunoon not brain-washing Gaasim, where is the chance for Yameen to be the President??? Unthankful Yameen.